Hydraulic Control Piping Assembly The hydraulic control piping assembly (fig. 5-6) consists of the control valves (stack valves), hose connections, and associated piping and fittings. Hydraulic fluid is provided to the JBDs by an inlet line and shutoff valve connected to the main catapult hydraulic system. The inlet branches off into three lines (Mk 7 Mod 0/2) or two lines (Mk 7 Mod 1) with each line connecting to a stack valve. The stack valve controls the flow of hydraulic fluid to and from the hydraulic cylinders. 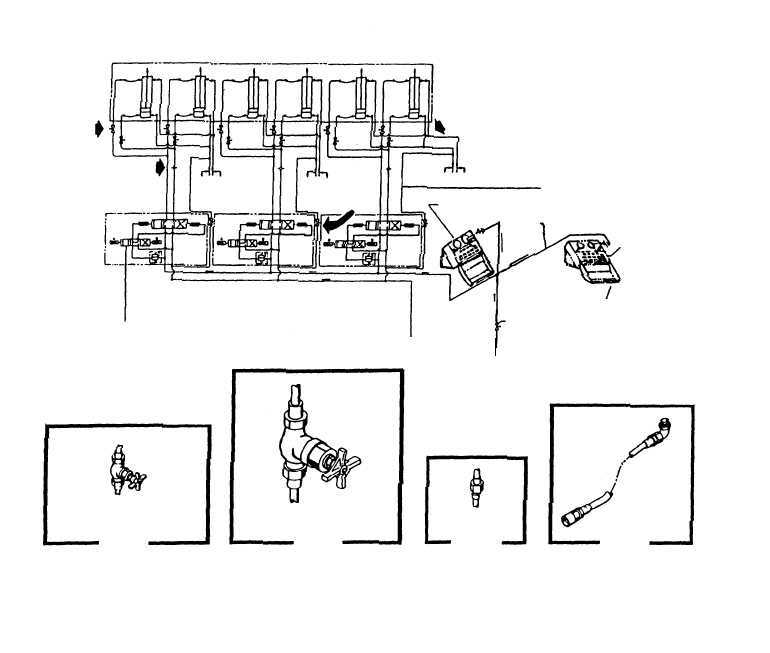 Emergency-lowering bypass lines and valves are connected to the raising side of each cylinder and to the gravity tank return lines. The bypass lines permit routing of fluid around the stack valve and are only used during an emergency situation to lower the JBD panels. An orifice assembly is provided in the line to the raising side of the hydraulic cylinders which maintains control of fluid flow for both the raising and lowering sequence. Shutoff valves are located in each line of the hydraulic cylinders for emergency and maintenance purposes. Hose assemblies provide a flexible con- nection between the hydraulic cylinders and piping to compensate for movement of the cylinders during raising and lowering operations. 5-6 PORT B PORT A REFER TO VIEW D TO ATMOSPHERE EMERGENCY LOWERING BYPASS LINE AUXILIARY CONTROL PANEL VIEW A VIEW B VIEW C VIEW D TO GRAVITY TANK FROM CATAPULT HYDRAULIC SYSTEM FOUR-WAY CONTROL VALVE (STACK VALVE) TO ATMOSPHERE TO ATMOSPHERE REFER TO VIEW A REFER TO VIEW C REFER TO VIEW B PRESSURE GAUGE PIPING EMERGENCY LOWERING BYPASS SHUTOFF VALVE CYLINDER PORTS A AND B SHUTOFF VALVE ORIFICE ASSEMBLY HOSE ASSEMBLY ABEF0506 DECKEDGE CONTROL PANEL (IF USED) SYSTEM SHUTOFF VALVE Figure 5-6.Hydraulic control piping assembly.